All animals have every right to be happy, safe, and free. The story of these six hens who were rescued from this facility will spread like wildfire, and the power of open rescue will be shared across the globe, exposing the violence of animal exploitation. Join the animal rights movement today and you too can change the world for animals! Normally, there are only three types of people going into a place like Ming’s Poultry: customers, workers, and the victims. But not last Tuesday. For the first time in San Francisco history, a different group of people entered this horrific facility in the name of DxE Open Rescue. I was part of this group of animal rights activists who bore witness to the suffering taking place within those walls and who saved innocent lives. Inside of Ming’s, we found birds in crates and cages stacked 5-6 feet high, all covered in feces. Walking past the crates, I witnessed pigeons gasping for air, as if they only had a few breaths left in them. We were horrified to see one pigeon suffering from what appeared to be a broken neck, nearly half-dead. Some of the hens had their eyes pecked at by the other birds due to the extreme crowding they experienced in their cages. Blood was dripping from their eyes all over their faces. Other hens had eye infections and some had gone blind. One blind little bird I can never forget. They were running around the floor of the wire cage, poking their head out of one opening, and then the other, searching in vain for any way to escape their imprisonment. There were pheasants crammed into cages so small that all they could do with their bodies was sit there in utter misery. Roosters were crammed so tightly that they couldn't turn around or even spread their wings. In several of the crates, there were birds standing over the dead bodies of those who had already died from starvation or from being crushed. I followed Wayne Hsiung towards the back of this hell hole where the workers performed the slaughter. Upon entering this room, I looked down and there, next to my feet, were bins filled with the dead bodies of birds who had been de-feathered and had their necks slit. I had trouble breathing due to the lack of ventilation and the filth and feces that filled the air. As Wayne pleaded with the worker in Chinese to end these acts of violence, I couldn’t help but pity the worker. He didn’t say a word at first. The man stood there in front of the wringer with his head hanging down and his arms by his side. In that eerie room, I also stood still, filled with disbelief. How could this sort of outright violence be so normalized? I thought about my past visits to the city of San Francisco and how beautiful it always seemed to me. Yet, as I stood in that back room, I felt as if I was in a horror scene in a movie. It was painful for me to witness the conditions of that facility. Still, as atrocious and scary as it was, I didn’t once feel tempted to run out of there. Those innocent birds needed our help. They were literally crying for help. As I stared into their eyes, they stared back into mine, and it was obvious that they were searching for an escape. 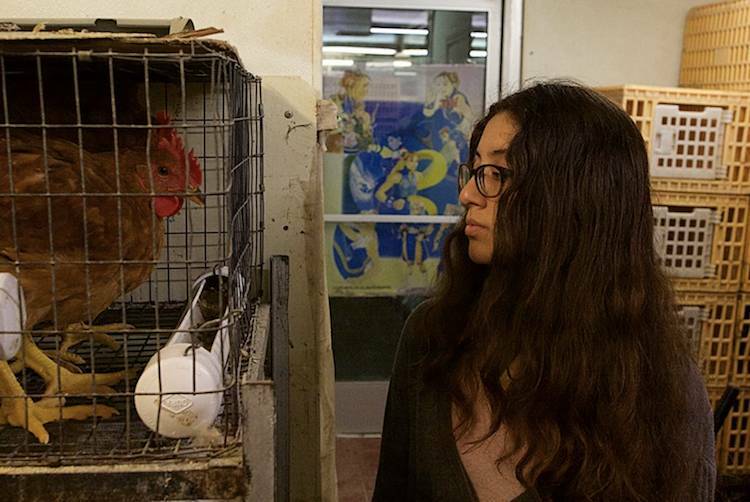 These birds were only a few months old and had never experienced freedom or human kindness. As Wayne placed the first hen into my arms, the young bird kept still, and I felt the lifelessness within her boney body. I’ve volunteered at many animal sanctuaries and I can tell you that chickens don’t typically like being held. They love and value their freedom to run around and explore. Walking out with these liberated hens and feeling their weak bodies in my arms, joy chimed in with the pain I felt. Joy because I knew that the very second Wayne removed these gravely ill hens from their cages and placed them in Hana’s and my arms, their fates changed completely. Instead of a violent death, these six rescued individuals would experience the freedom they deserve, the freedom that all the birds in that facility and throughout the world deserve. No one, human or non-human, was put on this planet to be treated so cruelly. For any reason. All animals have every right to be happy, safe, and free. The story of these six hens who were rescued from this facility will spread like wildfire, and the power of open rescue will be shared across the globe, exposing the violence of animal exploitation. Join the animal rights movement today and you too can change the world for animals!